We’d love your help. Let us know what’s wrong with this preview of The King's Horse - Book 1 by Adam Dreece. Christina Creangle stared at the smoldering ruins of her life’s work. When the Moufan, an ancient secret society, offered to take care of her senile father as repayment of an old debt, she agreed. The idea of isolation with both her protege and her legendary inventor father, was too compelling to ques An all-new steampunk-meets-fairy-tale series of heart, legacy, and duty. Elsewhere, in the ruins of a presidential palace, an old, mechanical horse is discovered that could tip the continent's delicate balance of power. To ask other readers questions about The King's Horse - Book 1, please sign up. This was a bit different than I was expecting. I have read some of Adam's other books and they seemed to be intended as children's books or very young adult. This one, while it had some of the same aspects of retelling fairy tales, seems geared to an older audience. It is a fair bit darker than the Yellow Hoods books, for example. For me, personally, I was absolutely fine with this. I like the worlds that the writer creates and I do not mind at all if you need to work harder to see the fairy tal This was a bit different than I was expecting. I have read some of Adam's other books and they seemed to be intended as children's books or very young adult. This one, while it had some of the same aspects of retelling fairy tales, seems geared to an older audience. It is a fair bit darker than the Yellow Hoods books, for example. For me, personally, I was absolutely fine with this. I like the worlds that the writer creates and I do not mind at all if you need to work harder to see the fairy tale aspects. There were a couple things here that I didn't care for, as much. The story jumps around a good deal, with frequent trips backward and forward in time. That disoriented me, a bit, and caused the story to lose continuity. I could gradually (kind of) sort things out. But I had to work harder than I would have liked. The characters also seemed inconsistent, at time, in terms of their attitudes. I questioned whether that character would have said or done something, based on what we knew about them from earlier parts of the story. In some respects, this humanizes the characters, because we are not always "consistent," in our thoughts and actions. In other respects, it makes them less "them" and somewhat more general, in nature. I am not sure if this was intentional, on the writer's part, or not. Clearly, this book is part of a series. That is always tricky, because you want the readers of THIS book to be satisfied with where it ends, because it might be the only one they end up reading. On the other hand, you cannot tie up TOO much, or there may be less reason to go on. I am not sure this book "sticks the landing," because it does not really have an ending, as opposed to more of a pause. But I have read far worse. Hoods and Chris Creangles and Moufan-Men, oh my! If you hear the echoes of a Tale you recognize, this is where we started shouting. People are as you know them, capable of shocking kindness and craven hurt. Heroes come from the same tired, fearful, hopeless places where we each have known defeat. The King's Horse speaks w Hoods and Chris Creangles and Moufan-Men, oh my! The King's Horse speaks with many voices. They're all gonna fill your head. You'll have at least five near-death experiences, and there's going to be a lot of yelling. Your friends might come check on you. One scene pulled my heart to tatters and I need a good cuppa and to call my daddy now. If you're looking for a story set in a fanciful but well-developed steampunk world, with hints of fairy-tales that an adult audience can enjoy, and which promises to be the first of a complex and interesting series, look no further. The story is told in the third person from multiple points of view, each character with vested interests of their own, but which, by the end of this first book of the series, promise to converge and conflict in interesting ways in the next volume. Despite following so many story lines, Mr. Dreece manages to cram a lot of story into each character's scenes and keep the entire book length very compact and readable, moving the action along at a good clip. My personal preference would be to see more of the scenes he had to gloss over in order to do this so I could connect with the characters on a deeper level, but then, the book would have had to be much, MUCH longer. For someone who likes to see the action and drama highlights, without a lot of the interim steps, this is perfect—and, of course, keeps the length down. One of my favourite aspects of the story was getting the sense that this world has a rich history. Enough hints were dropped to make me curious about his other stories in this world. Since I have bought nearly the entire "Yellow Hoods" series for my son (who loves them! ), perhaps I'll dive in and sate that curiosity. As a grammar and word nerd, my only major peeve was the number of editing (especially copy editing) errors that the book contained. The average reader may not notice most of them, but for those of you who care, like me, I wanted to mention it. The story is definitely worth reading in spite of them, but be forewarned. Adam Dreece has an especially imaginative way of taking nursery rhymes, fairy tales, folklore and twisting them into an edgy new mythos. The King’s Horse is the first novel in a new series; yet, it is a continuation, in a sense, of his tales of the Yellow Hoods. It is not necessary to have read the Yellow Hoods; however, the stories are great and would give a depth of background that would add another layer of enjoyment. 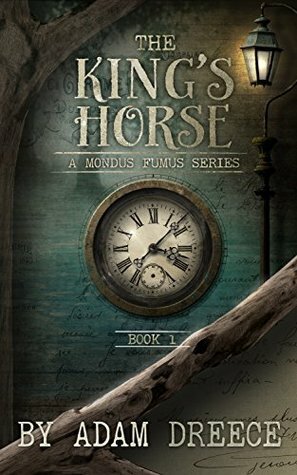 Dreece calls this world Mondus Fumus , where Steampunk joins with Fairy Tal Adam Dreece has an especially imaginative way of taking nursery rhymes, fairy tales, folklore and twisting them into an edgy new mythos. The King’s Horse is the first novel in a new series; yet, it is a continuation, in a sense, of his tales of the Yellow Hoods. It is not necessary to have read the Yellow Hoods; however, the stories are great and would give a depth of background that would add another layer of enjoyment. Dreece calls this world Mondus Fumus , where Steampunk joins with Fairy Tale. It is an apt description. This society venerates “Conventioneers” (inventors) especially those considered giants such as Christophe Creangle and Nikolas Klaus. Each was outstanding in his own right, but together - amazing. Well developed charaters, complete with interesting backstories, are the foundation of this action packed steampunk adventure. Adam Dreece has a flair for imagry and I found myself lost in his world of puns and reimagined icons of folklore. I think this one will be enjoyed by the mature reader of ya fiction as well as all us fun loving adults as well. This seems to be a smidge darker then his previous series ( The Yellow Hoods). Well worth checking out! Just a perfect beginning to a steampunk world continuing on with characters I first was introduced to in The Yellow Hood series. This new world has many familiar characters, introduces new ones (some of which I love to hate) and feels more adult than The Yellow Hoods (which I also loved). Can't wait for book 2! I am also 50 and enjoy this series immensely. In 2016 In 2014, I stopped my "hopefully one day" dream of becoming an author, stopped doing nothing with my writing, and kicked off my indie author life. Twenty-five years of doing nothing with my writing was enough, and after two medical events, I was filled with drive to change my life.